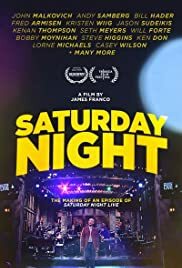 Although this came out in 2014, this is actually a chronicle by James Franco (also a former host) of the process in late 2008 how, over a week, a show of Saturday Night Live is put together. You see it all (compressed into 90 minutes), and you get to see a lot of the spitballing of ideas and jokes, the bits and sketches that seem genuinely funny with the cast (John Malkovich was the host and makes for a very game one as he is a great actor with comedic timing with a sense of humor about his career and persona), and how the producers fit into things and how choices get made. It may not be totally new for some, and if you've read the "Live From New York" book it's not very revelatory on the whole, except in the little moments. Getting to see people like Fred Armisen and Will Forte and Seth Myers in the midst of their over-night writing marathons in order to get sketches done for the read through is illuminating. You get to see how these very funny people take their craft seriously, to the point where people like Myers have comedy-fever-dreams (though when awake, as he admits, what he dreamed about isn't as funny as he first thought). A lot of any sort of creative process is trial and error, though one of the fascinating things to see is how SNL operates in a kind of imperfect system (a producer even says, you want to be a perfectionist don't work here). It's amazing to think about the shows that don't work - in full disclosure I haven't watched the show consistently in years, but when I do sit down and watch, depending on the host, there is still some strong writing and memorable sketches and characters, again depending on who is there - and yet look how awesome the effort is to put on the show as a whole. It's not simply about writers and actors (sometimes/usually both) getting together over the course of a few days to write some goofy things to play for people like Bill Hader (who comes off like a genius in that off-handed oh-it's-nothing way, though one big disappointment is that a Prince song is not allowed to be used - Franco should have just cut the scene, taken a page from the SNL book, but whatever). Its also about the crew who put together, almost from scratch, full sets in not days but *hours* in order to make things work in the context of the sketches. As can be seen some things may end up being funnier than others - I had the biggest laughs ironically at a sketch that ended up getting cut from dress rehearsal involving Malkovich repeating the Empire Plumbing phone jingle through the repetition via Forte - but it's extremely insightful into the depths of what is simply finding a way to make something funnier, and to both make one another in the cast laugh but also know what isn't stretching something too far. Franco's access lets him make some good choices as a director, and I enjoyed his loose, sometimes-fly-on-the-wall other-times-not approach (other times being, well, when he references when HE was on the show, cause why not). And of course, always there, whether you always notice him or not, is Lorne.